This guide will help you enhance your course by integrating library resources and services into your Blackboard course and syllabus. Please contact your liaison librarian if you have questions or would like assistance in developing your course. The CSUDH Library's research collections are developed and maintained to support the curriculum. As you are designing your course, look to see what resources the library currently has to support course readings, recommended texts, and streaming media. Search our most comprehensive catalog of books, ebooks, journals, articles, media, and more. A full list of databases that include streaming video content at the CSUDH Library. The library also supports course materials through Affordable Learning Solutions and Course Reserves. Did you know? You can make most of our online library resource available to students through Blackboard for easy off-campus access. You simply need to add our library proxy information to create a stable, permanent URL link to the resource. This lets library databases and vendors know that you are affiliated with CSUDH and have access to those resources. The permalink will prompt you to log in through the MyCSUDH portal first to verify you are an authorized user. Start in OneSearch, or go directly to Ebook Central and located the title of the ebook. Click on the Read Online button to open the content of the book. Next, click on the Permalink (chain) icon to create a permanent URL. 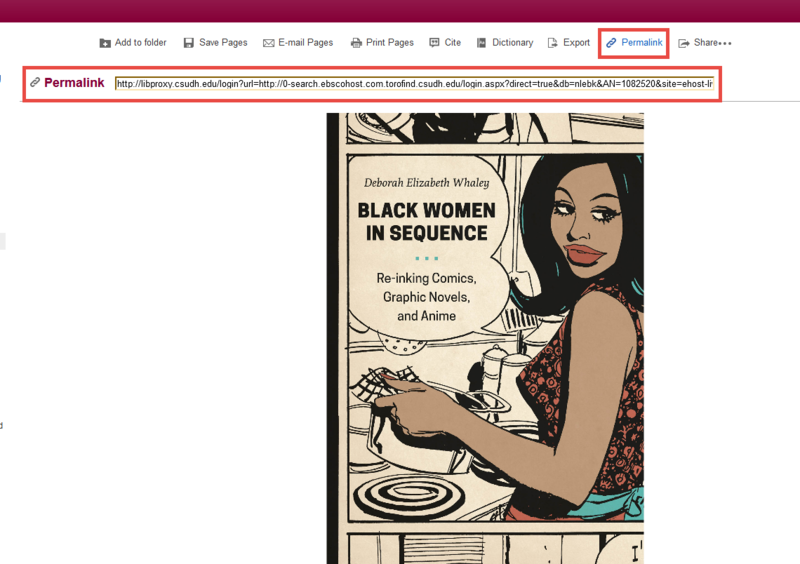 You can optionally send students to a specific chapter or page within the book, by navigating to that point within the book and then clicking the Permalink icon. After clicking on the Permalink icon, a pop-up will appear with the link you need. Start in OneSearch or go directly to EBSCO eBook Collection and located the title of the ebook. Click on "Permalink" to create a permanent URL. You can optionally send students to a specific chapter or page within the book, by navigating to the that point within the book and then clicking "Permalink." Navigate to the desired article, click on the "Details" or "Abstract/Details" link underneath the brief article description, then scroll down to "Document URL" and copy/paste the complete link provided. Go to Article Databases and find the database you want to link to in Blackboard. Select the "Share" icon on the right of the databases, then copy and paste the friendly URL. This URL will redirect you through the library proxy automatically. 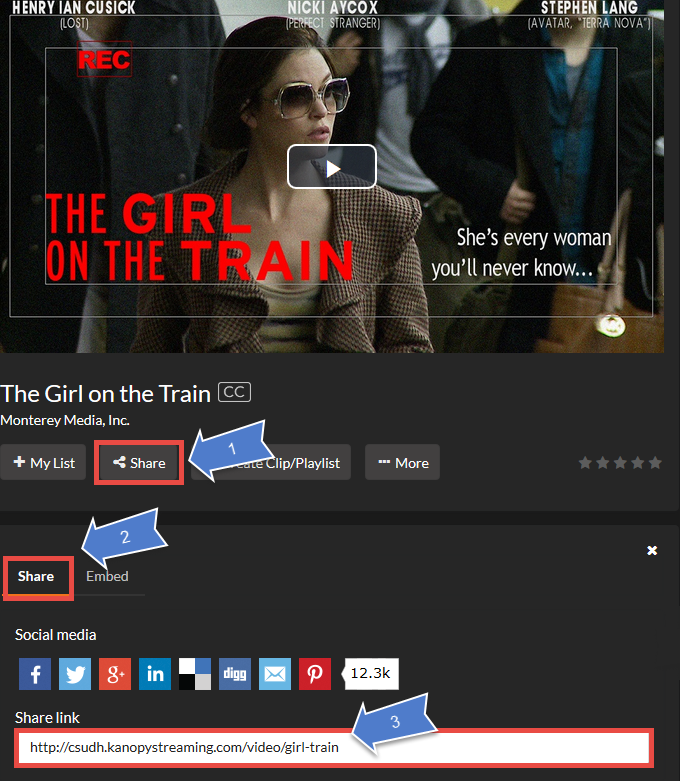 Find the video you want to share in Films on Demand. You can link to the full video or select "Segment" to link to a shorter portion of the video. 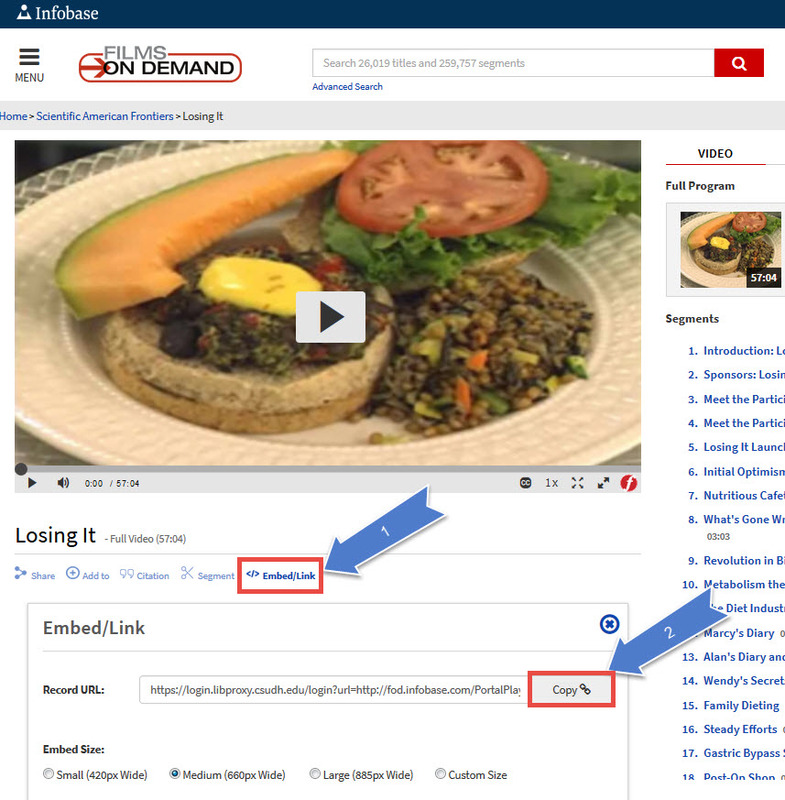 Select Embed/Link and copy the Record URL or the embedded HTML code. Find the video you want to share in Kanopy. 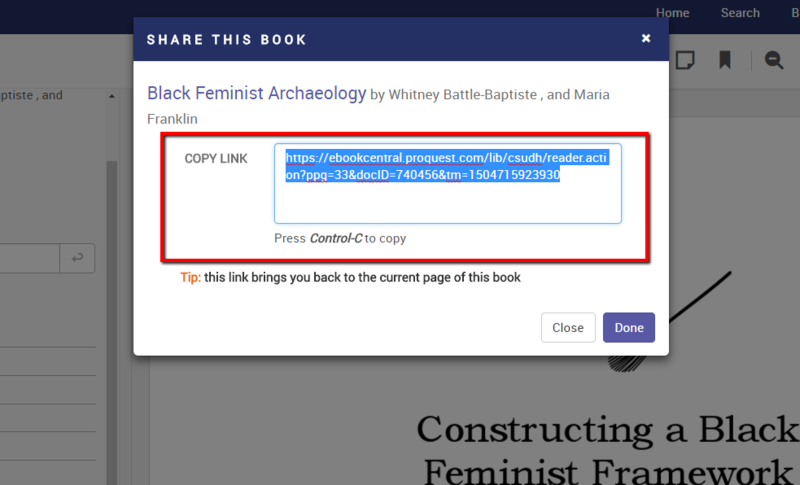 Select the "Share" tool then copy and paste the share link. Electronic library resources: If the article or chapter you wish to upload is content we provide access to at the library, please do not upload a PDF, as doing so likely will be in violation of our licensing agreement with the vendor. Instead, please provide a permanent link to the article in Blackboard. Print library resources and non-library resources: When determining whether it is permissible to upload copyrighted content to Blackboard (provided you haven't explicitly obtained permission from the copyright holder), it is essential to determine whether your proposed use qualifies as Fair Use. For a full explanation of Fair Use and guidelines for determining the status of the materials you'd like to use, please see the "Fair Use-4 Factors" section of the CSUDH Library Copyright guide. In addition to this guide, please contact Dana Ospina, Digital Initiatives Librarian, or your department's liaison librarian. Copyright protections are given to any original work that is “fixed in any tangible medium of expression at the work’s creation.” Facts, ideas, U.S. government works and any work published before 1923 are considered public domain. How do I know whether my use of copyrighted materials is protected under the “Fair Use” clause of the Copyright Act? Fair use is a legal doctrine that allows the public to make limited uses of copyrighted works without permission. Fair use may not be what you expect. Therefore, do not assume that a nonprofit, educational use or giving credit for the source of the work, or that limiting access to materials to students in the class creates an inherent fair use. Fair use depends on a balancing of four factors, which may be addressed by a variety of means. Can I repost items I find on the web without having to worry about copyright? Isn’t all of that stuff in the public domain? Many people mistakenly assume that everything posted on the Internet is in the public domain. It is vital for you to know that current copyright law gives legal protection to nearly all text, images, audiovisual recordings, and other materials that are posted on the Internet, even if the original works do not include any statement about copyright. Always give attribution. Are you updating your syllabus? Submitting a new or modified course proposal to the University Curriculum Committee? Be sure to include the required Computer & Information Literacy Statement. Research guides are designed by librarians as a one-stop shop for recommended databases and step-by-step directions for conducting research in a specific discipline. 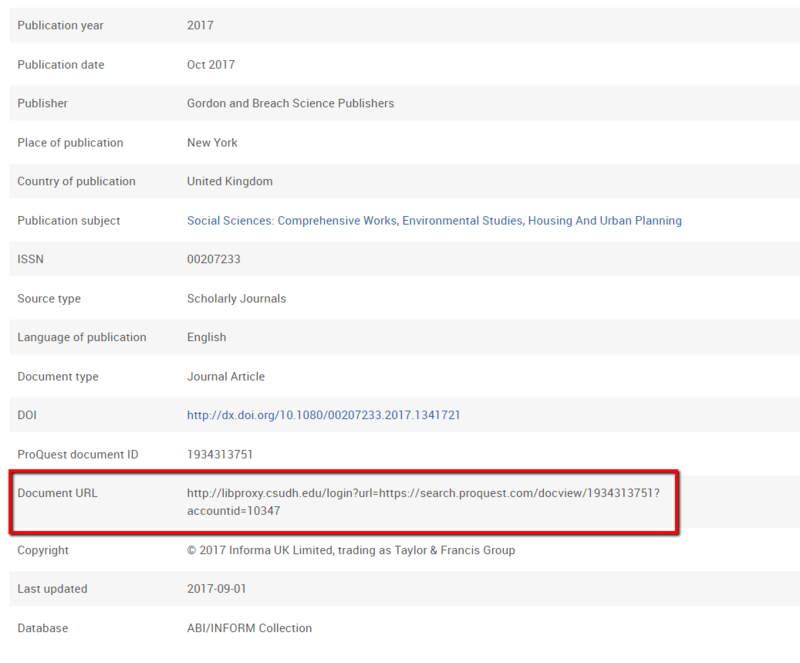 Add the friendly URL to a research guide to add the link to Blackboard. Find your Subject Guide by College, or use the General Research Guide. The CSUDH Library provides custom tutorials, videos, and answers for common research questions. Consider including links to these resources in your syllabus, assignment directions, or Blackboard course.